It is going to be a glorious fall for women with short hair! Hairstylists agree that in the fall season, everything is about highlights and modern color mixes to enhance your facial features. There are plenty of fun and funky hair color ideas for short hair out there. You just need to pick the one that favors you most. A cute haircut for short, thin hair blended in with a lovely color turn you into a diva with no effort. In this post, we take a look at some of the most exciting hair colour ideas for short hair you might want to try. Nothing better reflects the glorious feeling of autumn than magenta. This color makes you think of freshly picked dark grapes, red wine, ripe fruits, and velvety sunsets. 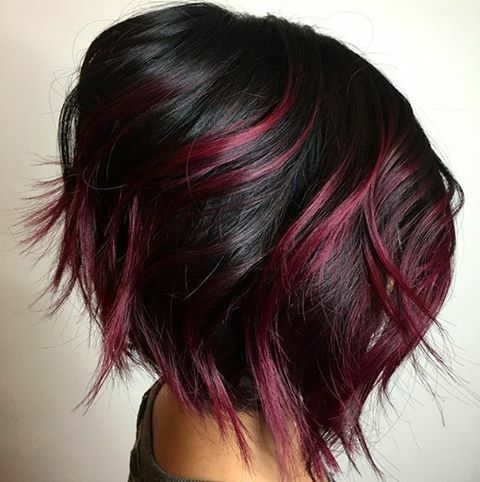 This magenta and black colored bob haircut is an example of fall hair trends done right. If you notice, the tips of her hair subtly fade into a pink to sweeten the color combination that might otherwise be a bit too dark for some women. This modern-meets-gothic look is one of our favorite hair color ideas for short hair because of its rich sophistication and bold versatility. This haircut and hair color works well with thin hair and even straight or curly hair, so you can be confident that this bob cut does justice to your hair type no matter what it is. 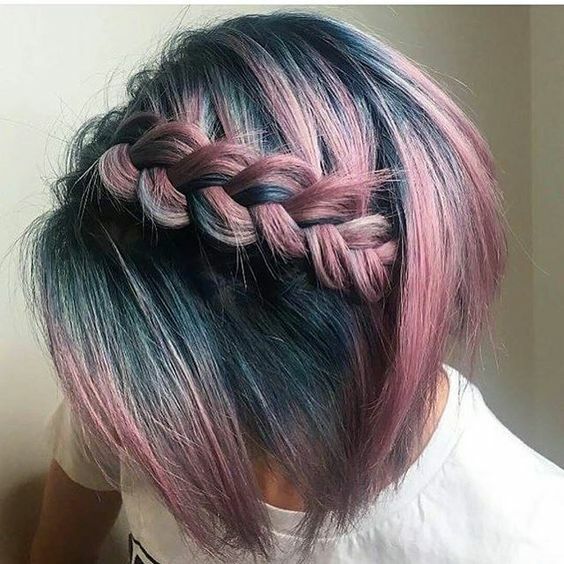 We chose this color combination and hairstyle for short hair for two reasons: braids will never go out of fashion, and this mix of colors is spectacular. A bob haircut is a stylish way to sport short hair at any age. By adding in braids to the style, you simply take things to the next level. If you already know how to braid your hair, let’s move on to talking a bit about the colors. What we have here is an ombre dusky rose to petrol blue mix. While it may seem at first to be a summer color mix, we think it’s perfect for autumn and winter as well. The petrol blue has a flair of coldness to it, sparked to life by the sweet rosy shades that provide some balance. One of the best things about this haircut and hair color is that they work amazingly even if you have thin hair. This fire-meets-ice color combination is a must on your list of hair color ideas for short hair to try this season. One of the most interesting styles that has started to become popular over the past few years is the use of all shades of colors via the peacock style, and we don’t see this going out of style. From sweet pastels to bright hues, and from sultry midnight blues to red wine shades, the peacock is an incredibly fashionable look. This is why we put this on our list of hair color ideas for short hair, and this particular combination specifically. The short, boyish cut with darker hair in the back gets a young and restless buzz with the mix of green, blue, and red strands. The short crop looks fantastic on women with fine hair and thick hair alike. The contrast and the gorgeous highlights in this look will definitely turn some heads. What are some hair color ideas for short hair you would like to try out for fall? Are you going to pick something entirely different in cut, style, and color next? Now that you have a few great ideas for coloring short hair, we are going to dig into some questions you may have in regards to hair coloring, blonde dye on short hair, and the perks of coloring hair! What Are Some Good Ideas for Hair Coloring? There are a ton of creative ways to color hair, from hair color ideas for short dark hair, hair color ideas for short natural hair, and even two tone hair color ideas for short hair to explore. One color that is in style right now is gray. Some awesome hairstyles for this color are the pixie cut, which is an excellent look for anyone wanting to go all the way with a short haircut. This look is classy as well as sassy. Great news: you will truly find so much freedom in having a pixie haircut, whether natural or permed. This look in gray is fantastic for people of all ages, from the older woman wanting to get a sleek and exciting new style to the young woman wanting a fresh and stylish do. Another good look for gray hair is a shoulder or mid-length hairstyle with gray all over and mixed-in highlights. If you are interested in being a bit daring, you may even want to try longer haircuts to show off the gray color. It is in style for all types of hair in this day and is considered to be one of the most fashionable hairstyles for women! Our next idea for coloring hair is pastels. This color idea is similar to our rose petrol blue highlights option found above in that it is blue and pink. The difference is that these pastels are actually bubblegum pink and baby blue, both of which are very desirable now. These colors both require a little more maintenance, but they are well worth it. Depending on how light or dark your natural hair color is or if you have light or dark roots to begin with, the exact tone you get may vary. But this is part of the fun! Getting to play around with the various shades of pastel is exciting until you find your perfect fit. Coloring your hair pastel is great if you need a change or need a new exciting twist in your life. The best part is that this hair color fits perfectly with the shorter hairstyle trends. Because it is hard to maintain, you will want to have short hair to keep this look up. The gray and the pastels are great colors for short hair this season! Does the Blonde Hair Color Look Good for Short Hair? It is believed by many that blonde hair is only a good look on those sporting long hairstyles, but that’s definitely not the case. There are so many great blonde hair color ideas for short hair! If you already have short hair and are looking for a way to mix it up and try something new, layering your hair and then dying it blonde may be an excellent option for you. You can also highlight your layers to give them a lively look. If you have a short bob, going full light blonde is a fantastic change as well. This style is a fun and playful way to change up your hair. Another great option is adding in gold tones throughout your dirty blonde or full blonde look. If you go this route, consider perm hairstyles, bangs with your short hair, or a rounded, playful bob. No matter what color you pair with your short hair, always remember to find a look and style you love. Mix it all up and play around with different styles. There are all types of cropped cuts you can try in the bob world or the pixie cut realm, be it a straight or curly hairstyle. When it comes down to it, this is all about finding what you love. Don’t let not having long hair stop you from enjoying beautiful colors and all their many shades! What Are the Advantages of Coloring Your Hair? There are so many exciting things for us to cover when it comes to the perks of color-treated hair. From improving your appearance to mixing things up, coloring your hair may be the best fit for you to get your desired look if you want a crazy hair change. This advantage may be an obvious one, but it is one of the greatest perks of hair coloring. A woman may decide to color her hair for a variety of reasons, and one of the most popular is mixing things up. Do you need a little shift in your life? Tired of the same old same old? Coming into a new season of life with changes in relationships, career, or hobbies, and looking for a style that will match that? It may be time to mix it up when it comes to hair color and hair styles. Changing the color of your hair has a way of making you feel like a whole new person who pressed the reset button. Most of us need a creative outlet to escape the mundane nature of day to day life and find some excitement and freshness. For many women, they shift their physical appearance to embrace creativity. This shift can be made daily by using makeup but an even more semi-permanent option is changing your hair color! Dying your hair is a super quick way to up your self-esteem. The best part is that you can do this from the comfort of your own home if you have the right tools and know how! Enhancing your appearance with a new hair color will make you feel better about yourself instantly. If you have virgin hair (never changed or chemically altered with permed hairstyles or with relaxers), this may be a massive change for you. But the shock of it will be met with a sense of excitement for something brand new to enjoy! Dying your hair can also make you look younger and fresher. If you are not seeking a considerable difference but want something new and fresh to add to your appearance, dyed hair is right for you. This is because there is not just one way to dye your hair, and it doesn’t have to be dramatic. You can add a simple highlight or opt for a blonde balayage style and get the same desired and exciting change. With hair coloring, there are so many options to choose. You have the entire spectrum of colors at your disposal. Every color and shade you can imagine (even including those you can’t) is available to you! You can change your hair color as drastically as you’d like if you are wanting something different or want to tweak your color. From white hair to black hair and everything in between, there is a whole colorful world out there waiting for you! No matter if you decide to cut all your hair off or already have short hair, the colors you choose to dye it will no doubt add some spice to your life. 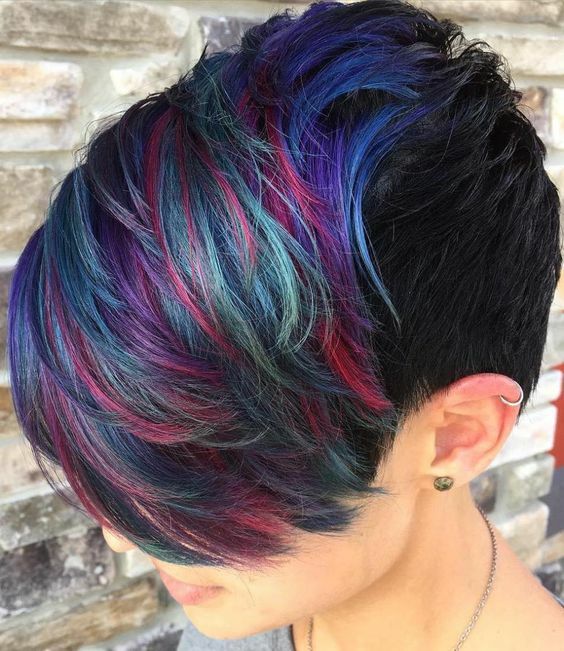 There are so many unique hair color ideas for short hair to choose from. Just this simple fact is exciting on its own! You can try highlights, magenta or ombre, rose petrol and blue highlights, or pastel-colored dyes. You can even go with peacock look where you have colors ranging from blue to green to red, all together in one incredible style. There are so many colors to play around with when it comes to short hair that will fit your face shape and skin tone like a glove! Previous articleLipozene Review: Can This Weight Loss Supplement Really Work? Next articlePhenocal Review – Is Phenocal the Best Diet Pill of 2018?